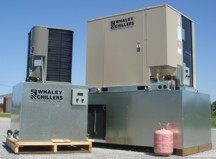 Whaley Products, Inc. has the ability to design, engineer, and manufacture your custom potable water system. No matter what your cooling requirements, voltage requirements, state or federal government regulation requirements, WPI will have a cooling solution to meet your needs. See all of our products.